There has been much speculation about the future direction of Fox News following Disney’s acquisition of most of the Fox entertainment assets. Rupert Murdoch remains at the helm of the cable “news” network, while his son Lachlan runs the new, shrunken Fox Corporation. Insiders are wondering about whether the network will continue to be the State TV division of the Donald Trump administration. Actually, most Fox News reporters are doing much of that branding themselves. While the primetime StormTrumpers set the tone for the network (with few signs that they are being reined in), the other hosts and contributors either back them up or decline to repudiate the lies and insults that are the red meat of Fox’s editorial mission. Trump recently took a gentle swipe at Fox News for briefly suspending one of his favorite fluffers, Jeanine Pirro due to her virulently racist comments about Muslim representative Ilhan Omar. He also propped up Tucker Carlson following his offensive remarks on a shock-jock radio show, and gave what he must believe is the ultimate insult to Shepard Smith by saying that he belongs on CNN. Sherman writes that the alleged “civil war” at Fox will be decided by Lachlan Murdoch, who is described as a “Libertarian conservative, not a MAGA diehard.” He suggests that the hiring of former DNC chair Donna Brazile signals a change in direction for Fox. That’s a weak argument considering that they also just hired the radical wingnut former congressman Trey Gowdy, who led the GOP-controlled committee that wasted years and millions of dollars on Benghazi hearings that produced nothing but ridicule for the Republican Hillary fetishists. You have to wonder where Hannity would go if he left Fox News. Other Fox alum have not fared so well outside that fortress of rightist disinformation. For instance, where are Glenn Beck, Greta Van Susteren, Bill O’Reilly, and Megyn Kelly today? 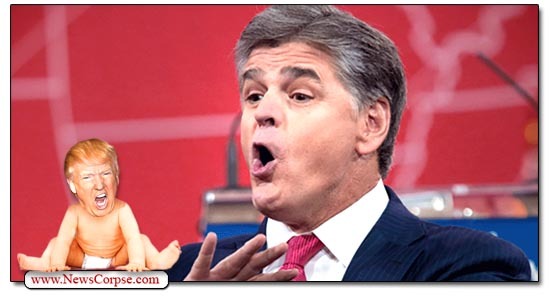 What’s more, Hannity’s egotistical opinion that he’s the glue binding Fox together is laughable. For one thing, he’s losing his time period to MSNBC’s Rachel Maddow. For another, his Fox stablemate, Tucker Carlson, is outperforming him on Fox. And the network still has Laura Ingraham, Neil Cavuto, Jesse Watters, and the “Curvy Couch” potatoes of Fox and Friends slobbering all over Trump. Finally, Sherman’s sources tell him that Fox News could be on the auction block. That would be an interesting development that would leave the Murdochs with just the broadcast entertainment network, their station group, and some cable sports channels. But even if Rupert were willing to let go (doubtful), who would buy Fox News? What media enterprise would benefit from owning a disreputable news outlet whose advertisers are fleeing in droves? Would the Murdochs (who are still the majority shareholders) allow a sale to Jeff Bezos? Or would they look for a conservative billionaire to ride up on a white (nationalist) horse? Time will tell.